We love to warm it up on cool mornings, heat in a crockpot with spices to make the whole house smell amazing or drink it cold with breakfast or a snack. Why not put this versatile and tasty beverage into a cocktail? When most people think about sangria, I know they think summer! Alas … we have got a few months to go before it is time to sip some sweet sangria outside. Even though we can’t be enjoying sangria under a hot summer sun, that’s no reason to set this drink aside for so many dark months. Sangria is such an easy drink to make for a crowd, it really should be made all year long. Any version of sangria generally involves fruit and wine. To make a sangria that is a little bit more appropriate for the cooler months, you just need to change up the ingredients a little bit. A winter sangria won’t need any grapes or peaches but chop up as many local apples and pears as you can find and add them to your pitcher. 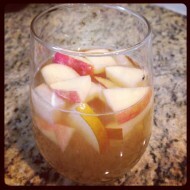 I made this amazing apple cider sangria for the first time this past Thanksgiving and it was a huge hit. I will be making it again for book club this weekend… Test this recipe out at your next party and I guarantee your friends and family will love it.